MEMPHIS, Tennessee (AP) — The Memphis Tigers finally get the UCF Knights on their own field with a chance at a bit of payback for the double-overtime classic that cost them the American Athletic Conference title last season. The Knights pulled out a 62-55 win that preserved their undefeated season. Memphis has been waiting since that conference championship for the rematch — and that showdown is Saturday. The 10th-ranked Knights haven’t missed a step, extending the nation’s longest winning streak to 18. While UCF is on pace for another conference title, the Tigers have only slim hopes of reaching the American title game again. Memphis (4-2, 1-2) has struggled on the road, losing games at Navy and Tulane, seriously jeopardizing all those preseason predictions that these teams would meet again for the league title. The Tigers are coming off a 55-14 rout of UConn . These teams should provide yet another game full of offensive fireworks. The Knights (5-0, 2-0) score 48.6 points a game and have topped 30 points in 18 straight games. “Their tempo is at warp speed,” Norvell said. UCF coach Josh Heupel wants his Knights ready for their first road game in a month, and wide receiver Tre Nixon believes they will be ready after a 48-20 win over SMU last week. “Everybody says we’re going to get their best, but they’re going to get our best too,” Nixon said. Memphis counters with Darrell Henderson, the nation’s top rusher, averaging 155.7 yards a game. His 11.8 yards a carry also leads the country. UCF quarterback McKenzie Milton finished eighth in the voting last season as a sophomore, and UCF has a new campaign for his junior year. He is averaging 300.2 yards a game and has thrown for 15 touchdowns. For Memphis, Henderson’s long scoring runs and double-digit average in yards per carry has him being mentioned as a longshot for the award. Henderson is leading the nation with 934 yards rushing. Brady White, a junior quarterback who took over for graduated pass-slinger Riley Ferguson, provides balance for the Tigers. The transfer from Arizona State tops the American in passing efficiency. He has thrown for 15 touchdown passes with only one interception in 156 attempts on a desperation pass against Navy. Back in the summer, Memphis promoted this game as a white-out with the Tigers intending to wear their all-white uniforms. 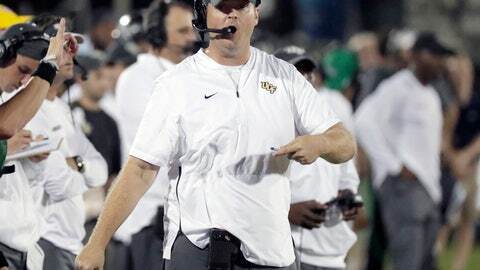 Someone forgot to get clearance from UCF, and the visiting team wears white unless both agree to a switch. The Knights balked, the Tigers changed and Memphis is promoting the game now as a blue-out encouraging fans to wear blue. Memphis opened the series against UCF with a 37-28 win in 1990. Since then, the Knights have won 11 straight in the series, including defeating the Tigers twice in 2017. FOR THE DEFENSE: Titus Davis, the Knights’ senior defensive end, was named the conference’s defensive player of the week after recording six tackles, a sack, three tackles for loss and forcing a fumble in UCF’s 48-20 win over SMU last weekend. He has 20 tackles, 6.5 tackles for loss and a pair of sacks this season. For Memphis, junior linebacker Bryce Huff has emerged with 15 tackles, 7.5 tackles for loss and a pair of sacks over the past two games.